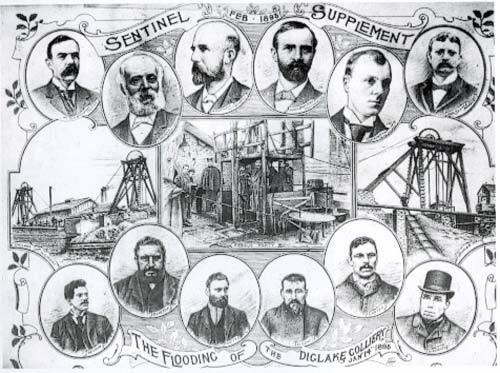 On 14 January 1895, a terrible disaster occurred at Diglake colliery, Bignall Hill. Two hundred and sixty men and boys descended the pit that day. At 11.30am a spate of water from the old flooded Rookery pit, augmented from above by the inclement weather, spewed into the lower regions of the Diglake mine, carrying and drowning everything in its path. Seventy-eight men and boys perished, some of the bodies never being recovered. The ones saved owed their lives to the heroic deed of the six men in the lower part of the portrait: Mssrs. Bateman, Boulton, Watts, Dodd, Carter, Hinkley.